Preheat oven to 220°C (425°F). Place the lamb in a large, deep-sided roasting tray. Place half the vinegar and half the sugar in a bowl and mix to combine. Rub the mixture all over the lamb. Add the water, sherry, rosemary, garlic and remaining vinegar to the pan. Rub the remaining sugar over the lamb and sprinkle with salt and pepper. Cover loosely with aluminium foil and cook for 15 minutes. Remove the foil and cook for a further 20 minutes or until the lamb is dark golden and crisp. Carefully remove the lamb and add the silverbeet and artichokes to the tray. 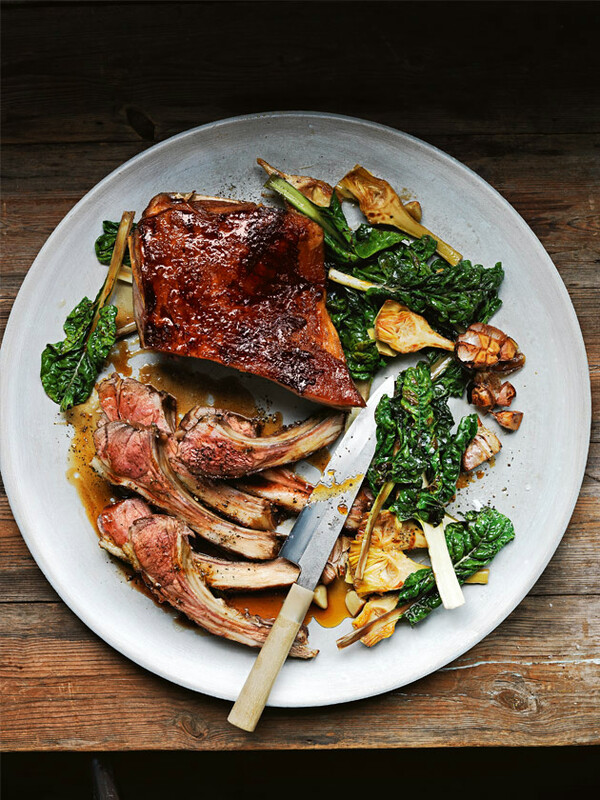 Place the lamb on top and cook for a further 10 minutes or until the silverbeet is just wilted and the lamb is cooked to medium rare. Slice the lamb into cutlets to serve. Serves 8. + We asked our butcher not to trim the ribs of our rack of lamb.